The variety of digital formats we can use to store our information is continuously growing more abundant. One of the most often used and consequently widely spread file types is the Portable Document Format, in short PDF. PDFs can be generated rather easily, but editing the enclosed data poses a few difficulties. An option would be to independently edit either the original text or the images compiled in the Portable Document Format. Now, to do that you’ll need a converter that can decode and disassemble the pdf file in its constituent parts for later editing. Such a tool is Docany PDF to Text Converter. 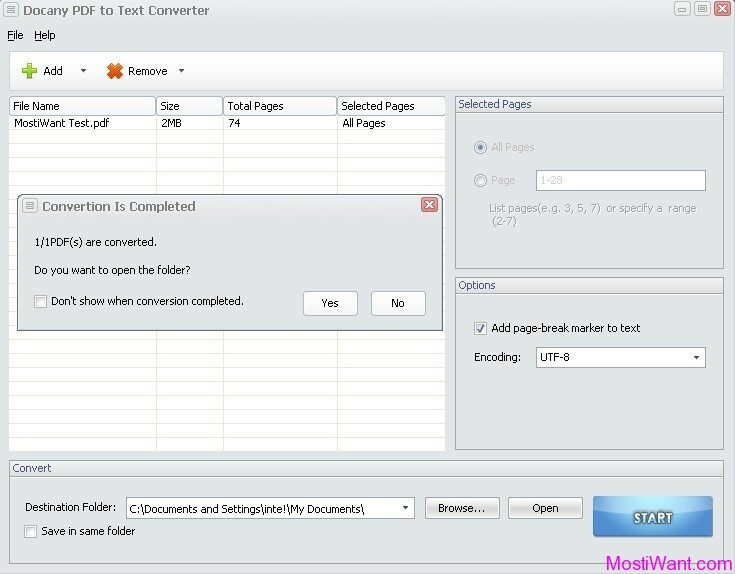 Docany PDF to Text Converter is an efficient and convenient program to convert PDF to text files in batch mode. With a few mouse clicks hundreds of PDF files will be converted to plain text files at one time. So you can easily edit, re-use, re-organize, present, and share your PDF files. Additionally, it doesn’t require Adobe Acrobat or any other PDF plugins to be installed. PDF to Text : Convert PDF to plain text, so you can edit, re-use, re-organize, present, and share your PDF files. Extract the text from a PDF file, and retain its original structure and layout. While this PDF Converter claims to support multi-language PDF files, it doesn’t support Chinese for me. When I import a Chinese PDF, it can convert only 2 pages of that file, no matter how many pages that pdf have. How does Docany PDF to Text Converter works? 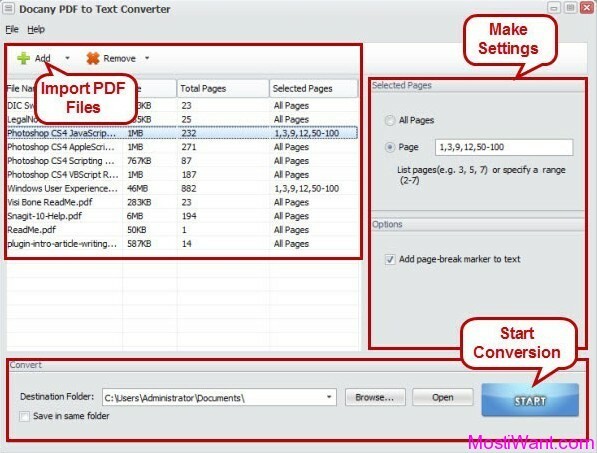 Docany PDF to Text Converter helps you convert PDF to text in just three steps. You don’t need to know more about PDF format or other settings, just run the program, import PDF files, and click Start then you can get your converted text. Here are the easy steps. In cooperation with Docany Software (developer of Docany PDF to Text Converter and sponsor of this giveaway), we can offer 20 free serial numbers / License keys to activate the Full Version of Docany PDF to Text Converter, each worth USD $19.90. A great contest, thank you! This is so cool and very useful software!Hope to win. thanks man. Consider me as well for this giveaway. Thanks Docany Software & mostiwant for this giveaway. hello, count me in ! Cool. Consider me as well for this giveaway. Thank you very much for this giveaway! This is so cool and very useful software! I am in … Hope to win… Thanks.